A network/desktop utility for IP address Change, IP address Finder and IP address Monitor. 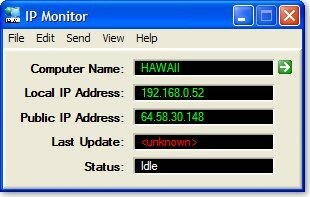 IP Monitor is network utility for Windows which displays the current IP address of a computer in a window. 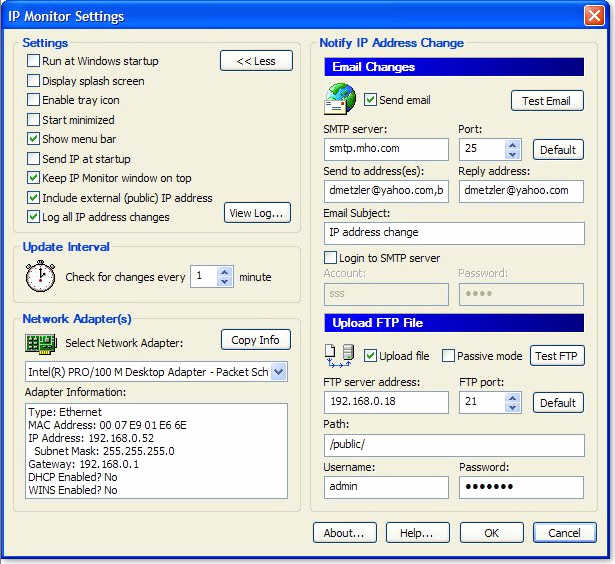 IP Monitor is also able to notify via FTP or email if a computer's IP address changes, a powerful IP address change, IP address finder and IP address Monitor software. Useful for network administrators to see what IP address a computer has assigned to it. It is also useful for dial-up users who are issued a different IP address each time they connect. Shows your current public IP address - NEW! New in version 1.5, IP Monitor can now display your external IP address. This can be different than the local/internal address if you are running on a network that has a router or firewall in place to access the Internet. In a TCP/IP network, each network node/computer has its own unique address by which it communicates with other computers on a network. This address is known as an IP address. IP Monitor tracks IP address changes on a computer. Some DSL or network providers assign dynamic IP addresses that change over time. This is to prevent you from hosting a server on a computer through a service that is not designed for this. However, there are times that a user needs to know if their computer's IP address has changed so they can take any necessary action to restart programs, file transfers or remote processes. Not only can IP Monitor detect a change in an IP address, but it can also notify you via FTP or email if this occurs. This is helpful if you are trying to access a remote computer whose IP address has changed. Configure IP Monitor to notify you and you will be able to continue to access the remote computer. IP Monitor can run with a command-line parameter to send notification when your system starts, and then exit. This makes any system start-up or restart notify your designated email addresses or FTP server about ADSL or cable-modem connections when your computer starts. You may even use this utility behind a firewall as it supports passive FTP mode. Simply download, install and run. You will be presented with a window (see screen shots) showing the current computer name and IP address of the machine.